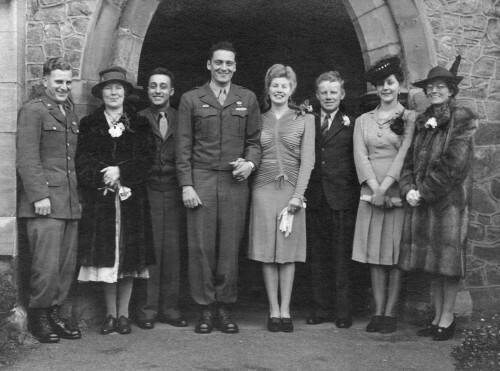 This is thought to be the the wedding of Barbara Spoor from Soar Road in Quorn, to William Murray (an American paratrooper), at St Bartholomew's Church, early in 1945. Barbara's parents were Robert (Bob) and Eva Spoor, and it is thought that the man to the right of Barbara may be her father Bob. Is this correct? The two ladies on the right have been identified as Eva Pepper (far right, wife of Cecil Pepper) and her daughter Addy Culley (nee Pepper). Can anyone help with confirming the information or provide any more names? Missing information: Can you help with confirming the information or provide any more names?